They’ve been 75 years in the making, with roots that go back to an English nobleman abroad…and have led them to create some of the most iconic hiking boots in existence. Craftsmen in north eastern Italy continue a heritage that began with the birth of the Societ Calzaturiera Asolana Riunita Pedemontana Anonima. Translated into English as the Associated Shoe Manufacturing Company of the Asolo Mountains, we know them today as Scarpa. When young Luigi Parisotto began to learn his trade at the tender age of just 11 in the 1940s, he could never have dreamed that he would one day take up the Scarpa mantle, propelling the company onto the international stage. It’s a far cry from the days when local landowner Lord Rupert Iveagh began the business simply to bring local leather-working skills to the attention of a wider audience. From long, gruelling hours turning out a handful of boots for peasant farmworkers, Scarpa now have a loyal fan base of customers across the globe. Their history of tradition has been fused together with the very latest in up-to-the-minute technology, resulting in one of the most copied and sought-after ranges of outdoor footwear and climbing shoes around. Scarpa’s rustic, agricultural beginnings started to alter course when they became aware of the rapidly-expanding mountaineering and climbing culture in their native Italy. They started to develop footwear aimed specifically at those keen to try out different pursuits, and very quickly found an ever-burgeoning market on their doorstep. Research was the key – the specialist features they incorporated into their boots and shoes led to many of Europe’s early mountaineering pioneers choosing Scarpa for their ground-breaking expeditions. In the 1970s, their breakthrough Rally boot was designed for ski enthusiasts, while the early high-altitude Grinta – later to become the still-popular Vega – became the footwear of choice for the Italian, U.S., Spanish and French military. Many top climbers ever since have taken their every step on the Himalayas and Antarctic in the Scarpa Vega. 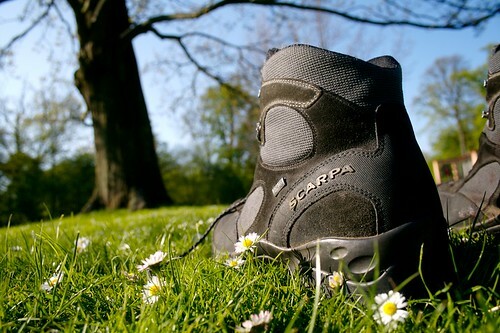 Scarpa innovations over the years have included the introduction of revolutionary Gore-Tex technology, now commonplace in walking and hiking footwear but at the time something outdoor enthusiasts could only dream of. Today, this family-run businesses is at the forefront of the industry, with their high-tech, high-spec range including the Phantom 8000 for technical Himalayan mountaineering, built for those wishing to take the toughest – and highest – challenges in their stride.